Hi Amber! Can you start by giving us an idea about when you started painting, and found a passion for botanicals? I have been painting and drawing pretty much since the age of 16. The art room in school was a good place to hide from hockey practice! My passion for botanicals came much later while I was studying for a Part Time Fine Art Degree in 1995. On a trip to Kew Gardens to sketch and gather information I found the shape and texture of various plants and trees inspiring. I was and still am coming to the subject from a painter’s angle not a botanist’s. Why do you think you’ve found this passion for painting and creating? I find nature fascinating and often while I am walking in the woods something will catch my eye and demand to be painted. Walking with my dog gives me the ‘headspace’ I need to gather my ideas together when daily life can be a little bit manic. I will often take a sketchbook with me to jot down ideas and sketches. My vegetable box delivery is another place where inspiration strikes often in a quirky or humorous way. If I haven’t done anything creative for a while I do find myself getting bad tempered and irritable, it’s a large and very important part of my life. I don’t find that painting is a stress reliever, in fact the opposite can be true, we all know that feeling when an important piece isn’t going well but painting does seem to release a tension and there is huge satisfaction in a positive end result. I can lose hours in a day when I am focused on something and I couldn’t imagine a life without some sort of creative activity in it. I think it’s important for everyone to have some sort of creative input in their lives, young or old, especially with today’s lifestyle where many of us don’t seem to have time to just sit and be and catch our breath and I love passing my knowledge and passion for painting onto others. You work in a variety of mediums, do you have a favourite? My favourite changes practically every week! I am a bit of an art supplies addict and love trying new supplies and seeing how far I can push materials I know and love already. Watercolour and coloured pencil come at the top of my list at the moment. I will use any media that is lightfast, artists quality and gives me the effects I need for the piece I am working on. The subject matter or idea for the picture will often dictate the media to be used. People love the unique elements in your paintings. Do you feel that you’ve found your unique style? I think that an artist’s style should be an ever evolving thing and we need to be careful not to become too complacent when we feel we have found something that works. It’s important for me that someone can recognise in an exhibition of many botanical works which work is mine. Comparing my current work to that of 10 years ago shows it has evolved a huge amount however there are elements that haven’t changed, I.e the botanical accuracy and detail and I would hope that in 10 years from now my work will have developed further but would still be recognisable as mine. What’s been the highlight for you of your art career so far? Looking back there have been a couple of key moments. The first was my acceptance to full membership of the Society of Botanical Artists in 2009. Having worked for 3 years to produce 5 paintings each year all of which had to be accepted was a huge achievement (luckily for future members this will no longer be the case when we update the membership in the new year). The second was winning the Great Art Award in the 2014 Exhibition. Other highlights include having my work accepted into exhibitions in China and France and winning prizes in other Art Exhibitions. The Great Art prize was awarded in the year that I first deviated from the path of traditional Botanical painting so it was great to feel that my work had been validated from a Botanical and a creative perspective, I was mentally prepared that year for all the works to be rejected!! One of Amber’s beautiful handmade artist’s books. Do you paint full-time? What else keeps you busy? I am currently teaching both Botanical Painting and Coloured pencil at Tunbridge Wells and Tonbridge Adult education centres, I also teach some small private groups so this takes up a large portion of my week. Other days you can find me painting work for exhibition submissions or making handmade artist’s books. As a council member of the SBA there is a portion of time spent every week on council business. I try to find time for swimming, the gym and walking the dog between classes. Weekends are spent catching up with housework and more ‘playing’ with materials in my studio. My painting/working/ teaching weeks are very much still based around term times. I have 4 teenagers/ young adults, 2 of whom are currently studying or working abroad so holiday times are spent catching up or visiting. Can you give us an idea about what an average painting day looks like for you? My average painting day starts at about 8.30am when all members of the household have left for work or school. On a good day I will then paint until approx half 4 while there is day light taking a short break for lunch/dog walking. I don’t like to paint in the evenings so late afternoon/evening is reserved for art journaling or working on my handmade books etc. If I am immersed in something and it is going well I take shorter breaks, other times you can find me procrastinating for hours!! What one painting accessory could you not live without? Probably my magnifying glasses these days! For very detailed work I will wear magnification of 2+ , essential for those sharp edges and use a lamp with a daylight bulb for strong directional light even for painting during the daytime. Secondly would be a sketchbook, I always keep one in my handbag as you never know when inspiration will strike. 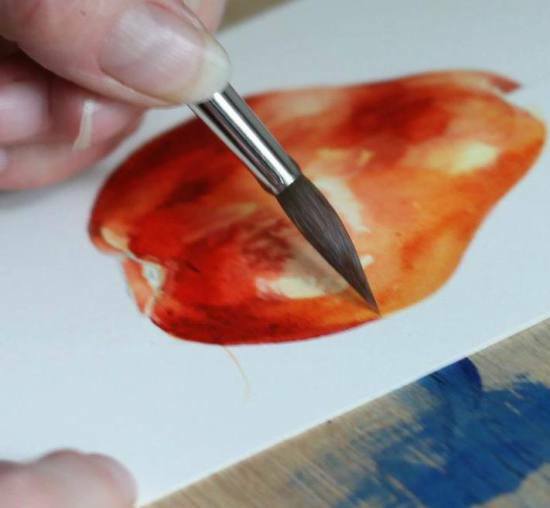 What advice would you give for someone keen to start painting, but unsure where to begin? My advice would be to join a local class to be taught the basic techniques from a professional. There are many good painting books and online courses available but my finding has been that a supportive group can kick start a permanent habit and an art class can be a sociable activity and a good motivator, we only continue to do the things we enjoy. Then progression is all down to practice and number of hours spent putting the paint on the paper. Facebook - Amber Halsall SBA – Botanical art and more. Kent Adult Education Website - here. From me and Amber, thank you so much for reading. Be sure to subscribe to my newsletter to be the first to read insights into other Featured Artist’s worlds, coming soon.